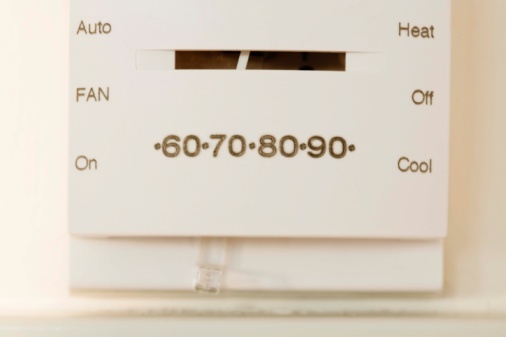 To some homeowners, their air conditioner falls strictly into one of two categories: working or not working. They simply have no working knowledge of how their AC manages to blow cool air on a hot day. But the experienced DIYer, who understands certain properties of the air conditioning system, can whittle down possible causes for problems. So when your air conditioner is running, but it's not keeping the house cool, it's not a bad idea to check outside to see if the compressor in the condensing unit is running and sweaty. The sweat on the compressor comes from the refrigerant's being compressed and turning cold, causing condensation from the humid outside air to collect on the compressor. This tells you that the pump in the condensing unit is indeed running, and is a good place to start troubleshooting. This dog is enjoying the breeze from the condenser fan. Remove the air filter from your indoor unit. Check to make sure it is not dirty. If necessary, replace it. See if the indoor blower runs when the thermostat is calling for cool. Don't just listen for the sound of it running; see if you can feel an adequate amount of cool air coming from the registers. 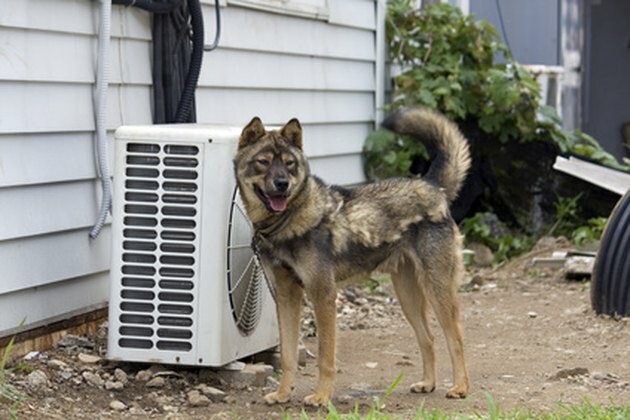 Sometimes dirt, pet hair, lint or ice from a frozen evaporator coil will block the airflow. Clean the underside of the coil or allow it to thaw to remove ice if present. Turn off the 220-volt power to the outdoor unit at the circuit breaker. Clean the condensing coil with either an air hose or cleaning solution and a garden hose. Be careful to not bend the aluminum fins. Use a refrigerant gauge set to check the pressures on the high and low side of the condenser. A sweaty compressor can be the sign of an overcharged system, meaning it has too much refrigerant. If you are unfamiliar with air conditioning repair, call a professional skilled in handling high-voltage equipment and high pressure refrigerant. Refrigerant can be toxic and cause burns to the skin. Remove the cover to the unit and consult the unit charging scale, which may be located inside the cover door. If the chart isn't there, consult the user's manual for your system, or information on the manufacturer's website, to determine the proper high side pressure and the low side pressure. Use a thermometer to measure outdoor and indoor temperature. Use the data to calculate the proper refrigerant charge, based on the manufacturer's refrigerant charging chart. If the refrigerant charge is too high according to this chart, excess refrigerant must be recovered and not simply bled out into the atmosphere. As most homeowners do not have the equipment, expertise and licensing to perform this safely, you should call a professional HVAC contractor.